Coffee is one of the most famous and most consumed drinks in the world. The reasons for that are many, and for a lot of people it can simply be about the taste. Coffee is a drink to be enjoyed, but it can also bring about a whole host of incredible benefits that can make you a better worker. Whatever you do for a living, or whatever sports you enjoy, coffee can make you more productive for a number of reasons. Here we look at 10 ways that having your favorite cup can help you achieve everything that you want to achieve. Studies have shown that coffee can help increase your physical endurance for when you are doing the more manual tasks. If you’re have a physical job and are getting a little tired, coffee and give you that boost to get the job done. It’s not just productivity in the workplace though, you can also increase your productivity in your physical exercise and coffee might give you that boost to run that extra bit further or cycle that extra bit longer. It’s not just your brain coffee helps, it’s your muscles too which can give you the strength you need to complete your work. Your brain is quite obviously a precious piece of your body that needs to be looked after well. There are many times, however, when your brain might swell slightly which can lead to problems such as tiredness and headaches. There are properties in coffee which give it natural anti-inflammatory properties which can help to reduce this if your brain is inflamed. Not only has that, but caffeine in the right amounts been proven to help with headaches. If someone has a sore or stressed brain, it’s very difficult to be able to work effectively and thankfully, coffee can help with this. This is the obvious one, and one of the main reasons that it is so often picked up in the workplace when people are feeling a little tired. When you’re doing any type of work, it can be difficult to keep your energy levels high, especially if you’ve not managed to have enough sleep. Coffee can be a fantastic aid to give you an energy boost through its caffeine and make you be able to hit the rest of your day with a lot more enthusiasm. Coffee has been used for hundreds of years to give people that little spark of energy when they need it most. A tired brain is an unproductive brain. If you are tired then it is incredibly difficult to focus on the task that you have in hand. I’m sure everyone has been there when they have done some sort of work when they are tired, only to check it the next day and wonder what you were thinking. When you lack focus and attention, it leads to work that is far below the standards that you are capable of. Coffee can make you more alert to be able to complete the tasks you need to the standard that you expect from yourself. Most people are expected to work to a certain pace and what can be stressful to many. Sometimes you can be reading, writing or simply putting away stock and wondering why you can’t do it even faster. It can be frustrating at times, but once again coffee can provide the answer. Coffee has the ability to allow us to process information a lot more quickly so that we can learn faster and make better decisions. That increased cognitive learning process will not only make your life easier, but it’ll make you stand out above the crowd. Coffee is a curious drink for many people, in that it’s not just about being thirsty as it is with most. Coffee has a romantic element, and many people fall in love with the warmth of the cup, the aroma of the beans and the taste that they have. Humans are creatures of habit, and making your coffee the exact way you want it can be a cathartic experience. Having that cup that you crave can start your day off in the right way, and everyone knows that a happy worker is a more productive worker. Naturally there is a caveat to this as it can often depend on how you have your coffee. If you’re having those cups with full-fat milk and sugar then the positive effects of coffee will be outweighed by the calories you are taking. Coffee though has been proven to increase your metabolism which is the speed at which your body uses calories. A high metabolism reduces the production of fat. Burning that fat will make you feel more physically capable and also make you feel better about yourself. If we’re talking about being away from a club or a bar, when coffee is the ultimate social drink. Being able to talk about the weekend’s events, the latest gossip or confiding in a work colleague over a cup of coffee are rituals that are done the world over every day. That increased social element will help you feel more comfortable in work and you’ll find it easier to talk to your colleagues away from the coffee machine. This conversation on your break can lead to much easier conversations about things that matter much more to you. As with many of the items on this list, the effects can be lost if you’re taking in far too much caffeine and many people will know what I mean when it comes to motor function. Many of us have gone a little bit over the top with our coffee drinking and ended up with a shaky hand. If you drink it in moderation, however, coffee can actually increase your motor function. Hitting all the right keys on your keyboard can be a lot faster if you’ve just had some delicious coffee. The intriguing thing about coffee is that it is such a part of our modern lives that many of the changes it can bring aren’t actually about the coffee itself. When you have your favourite cup in your hand that is giving you more energy, focus and attention, it can also increase your creativity as well. The reason for this is that due to the conversations that you have while drinking a cup, you’ll actually be able to bounce off other people and feed off their ideas to increase your own productivity. As we referred to before, the great effects that coffee can bring can only be achieved by drinking it in the right amounts. Being addicted to coffee can be a dangerous thing and can ruin all the things that make it such an incredible drink. A few cup a day though can give you a whole range of benefits. 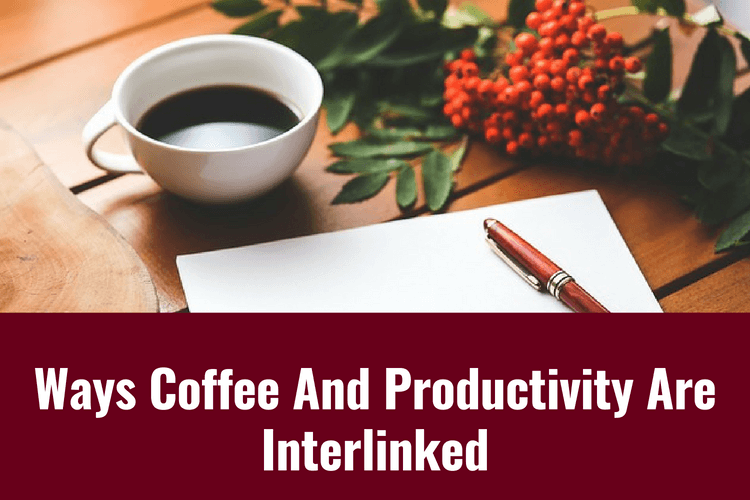 One of the keys to a more productive you could well be heading into that coffee room, making your favorite drink the way you like it and heading your desk motivated and ready to tackle anything that the day may throw at you.